Sleep: It would be great if I didn’t have to pee every hour on the hour. 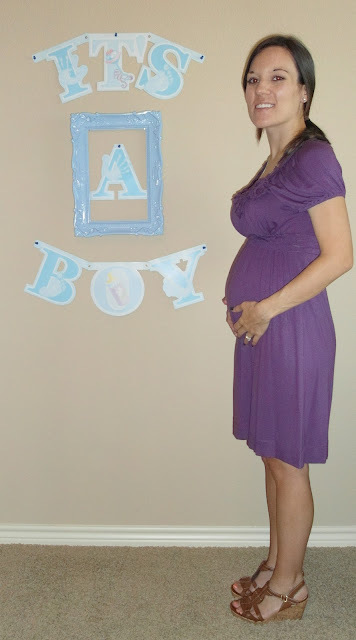 Best moment this week: Finding out that we are for SURE having the little BOY we were hoping for! Miss Anything? Summer poolside drinking. Movement: He moves SO much..I love it!! I never get anything done because I constantly just sit with my hand on my stomach. Food cravings: Nothing in particular this week…other than hot dogs. I don’t know what it is! Matt grilled me up a batch…yumm. Symptoms: Nothing really to report this week. Looking forward to: Not having to take back everything we have bought…and finally getting to paint the nursery! This entry was posted on Tuesday, June 19, 2012. You can follow any responses to this entry through the RSS 2.0. You can leave a response.